When you're on a boat out in the water admiring the views of Destin Harbor all around you, it is hard to imagine a more perfect landscape. However, if you're right at sea level, you won't get the best views. On busy days, particularly in vibrant areas like Crab Island, you might not have much visibility beyond the next boat. With a double-decker pontoon boat, however, you'll be giving yourself a serious lift! At a slightly higher elevation, you will be able to make the most of the amazing scenery and have a better view over the water, the nearby coastline, and the surrounding boats. This is especially important for any budding photographers who are hoping to take pictures while out on the water. If you're chartering a pontoon boat, you're probably not getting it just for yourself. Whether you want your whole family to come along for the adventure, you're inviting some friends, or you're organizing a group or club trip, make sure your pontoon has enough space to comfortably and safely seat everyone. 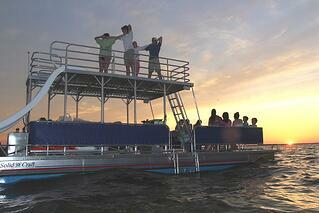 With a double-decker pontoon boat, you can accommodate a significant number of people. A 30-foot pontoon boat can hold up to 12 passengers! This negates the need for many groups and families to charter a second boat. In many cases, chartering the double-decker is cheaper because the cost is divided by the passengers on board. Chartering a double-decker pontoon boat in Destin, Florida, offers countless activities for passengers. You can set off into Destin Harbor or Choctawhatchee Bay, feeling the wind in your hair and the sun on your skin. You can also bring along some fishing equipment to catch your dinner, or you could try snorkeling or swimming in a peaceful and secluded spot. One of the most exciting ways to make the most of your double-decker pontoon, however, is with the double-decker slide! This incredibly fun slide is water-powered, propelling you from the top deck of the boat into the water below. The best double-decker boats boast two slides for double the fun! The slides are a hit with kids and adults alike. Many travelers who come to Destin are thrilled about the chance to work on their tan. However, not everyone wants to spend a full day in direct sunlight. That's one of the reasons it is so much better to find a pontoon boat charter that offers the option of shaded seating. One of the best aspects of chartering a double-decker pontoon boat is that the lower deck inherently provides shade. This is a smart way to ensure that all passengers are having fun and avoiding a sunburn, and it is far, far easier than worrying about big umbrellas while you're on the water. Double Fun Watersports can provide you with the hottest double-decker pontoon Destin has to offer. Whether you're just relaxing, spending time with family, or living it up at Crab Island, these incredible pontoon boats are the perfect way to spend a day while on vacation.